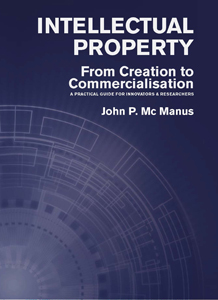 In INTELLECTUAL PROPERTY, John Mc Manus focuses on the specific information needs of innovators and researchers from the point of creation of IP to eventual commercialisation. Jargon-free, INTELLECTUAL PROPERTY highlights the legal and commercial issues necessary to protect and fully exploit the value of IP created during the research process. INTELLECTUAL PROPERTY: FROM CREATION TO COMMERCIALISATION provides a detailed grounding for innovators and researchers. The book starts with the source of innovation – that is, at the point where resourcefulness and creativity combine to develop new opportunities through problem-solving – and examines the critical steps that need to be carefully managed in the process surrounding the creation of IP and managing its development from concept through to exploitation. This involves the steps of identifying, capturing and assessing the value of IP. Useful recommendations for managing the transfer of IP from a research environment to the knowledge economy are provided and case studies illustrate pitfalls to watch out for. How to present a viable business case to potential funders and investors. The first sections of the book provide an overview of intellectual property and how it might be used to protect nascent technologies. These sections are pleasingly free of legal jargon and provide an unfussy overview of the patent application procedure. However, it is the later sections of the book that appear most useful. Here, the author concentrates on topics concerning the exploitation of technologies. The author does well to emphasise the importance of issues such as inventorship, ownership and conflict – typically thorny issues in university research. Overall, the author has done well to highlight the commercial issues that arise as a technology is taken from the laboratory and into the market, and the book makes for an informative read. It’s a wide ranging treatment of this subject and moves from a broad understanding of innovation and the IP process to looking at operational detail and procedures, including assessing the most appropriate routes to market, such as licensing or sale of IP or setting up a spin-out company. Creating a strong business case for funding is also covered. The book is well researched and accessible and should prove a useful starting point for inventors and innovators who wish to leverage their IP. Patents and ancillary means of protecting the fruits of organised scientific research are very much more the concern of innovators and researchers than are rights in trade marks and many forms of copyright, and this is reflected in the author's guidance to his intended readership. This guidance, incidentally, spans not merely the period from the IP's conception to its birth: it runs a long way both ahead of and after that period, taking in areas such as due diligence, project management and IP valuation which are more the province of the men in grey suits than those in white lab-coats. Oh, and there's also a useful three-page table listing acronyms and initials that the reader is likely to encounter both in reading this handy book and, if his innovation is worth exploiting, in the real world thereafter. You’ve got a great idea – but how do you develop it while making sure it remains your property? John P Mc Manus’s Intellectual Property provides groundwork on how to commercialise your ideas. This is a solid, workmanlike guide that will give readers a basic understanding of how intellectual property works, with some interesting case studies: Dunnes Stores vs Karen Millen, Monsanto vs Cargill, Ethicon vs United States Surgical Corp.
Mc Manus explains how a researcher’s idea becomes a commercial property, and step-by-step, how patents are searched to find that it is truly original, and then how a patent is planned and lodged. In this very technical book, he goes through all aspects of the process, from scientific research in universities – and the conflicts of interest that can arise when these results are patented – to how intellectual property is valued, and how this value is realised in commercialisation. It goes wider, with guides to protecting IP, assessing the most appropriate route to market and presenting your business case to investors. Intellectual Property is in no way a light read, but it is a useful book for anyone with an original idea to patent, own and develop as a commercial reality. Irish start-ups involved in developing new technologies must protect their intellectual property (IP), according to Dr John P Mc Manus, IP specialist and author of Intellectual Property: From Creation to Commercialisation. Failure to devise an IP strategy can cost firms money in the long term, he said. Any firms seeking investment through the Government or banks, particularly in the technology sector, must had an IP strategy in place, added Mc Manus. He has noticed a bigger interest from Irish start-ups in filing IP protection in the past 10 years. “Nobody knew what IP protection was 10 years ago. Now, when I mention the word people have heard about it and want to know about it. More SMEs are attending training courses and know they have to get up to speed on IP,” said Mc Manus. IP covers the areas of copyright, patents, trademarks and design protection. The Irish Patents Office deals with registration of patents, trademarks and designs in Ireland. As part of their IP strategy, firms must decide which countries in which to register their IP. “You need to establish where you will be active, and have your IP protected in those markets,” said Mc Manus.